Designed to pump 40,000 gallons of water an hour for the park's irrigation needs, the Murphy Windmill was a gift from banker Samuel G. Murphy back in 1905. September in San Francisco means hot Sundays, and today is no exception. I leave my house in Noe Valley where I live in exile, and head over the hills to the western neighborhoods. 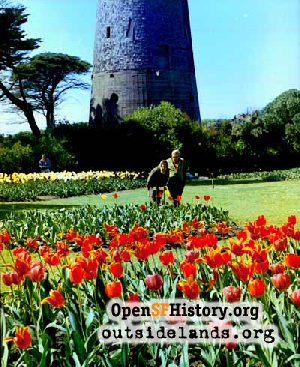 I hope to take a walk among the park windmills and want to spy Mile Rock lighthouse from Sutro Heights. Up to Twin Peaks, and I take a quick look back at the eastern skyline: blue skies with just a smudge of smog. On the far horizon the arrow point of Mount Diablo takes aim at the heavens. I turn south, drive straight at Mount Davidson, take the right on Woodside, and boom! All over Forest Hill creep fingers of fog. Undaunted, I continue to the beach and park my car just inside the southwest corner of Golden Gate Park. The flannel shirt is back on and immediately soaking up the mist that floats all around me. To the Murphy Windmill I trudge, wearing cargo shorts and a smile. In this weather the shorts mean I am a tourist (from the banana belt off Mission Street), and the smile means I'm an old salt from the Richmond District who loves fog. And I love the windmills, anachronistic oddities that they are. Why are these ridiculous fat things here at all? Designed to pump 40,000 gallons of water an hour for the park's irrigation needs, the Murphy Windmill was a gift from banker Samuel G. Murphy back in 1905. At least half of the slate shingles have dropped off the old lady. Orange plastic fencing encircles the stone base to prevent anyone from being cracked on the head by falling debris. I can see into the poor creature, see the wet air soaking the wooden skeleton within, the old steps that circle up. Pigeons by the dozens are comfortably dozing inside. Toothy gears as tall as my waist and bits of the old wood spars--black with age and neglect--stand in an inelegant pile in the bushes. The blades reached 114 feet from tip to tip. At the time of construction this was supposed to be the world's largest windmill, but there doesn't seem to be much lumber left here. I take a quick circle to the brick cottage that the Reid Brothers designed for the windmill's caretaker. The cottage has fared better, with only a few cracked windows, and the dog statues that guard the doorway are intact. A couple of pickup trucks in the driveway make me think park service employees are making use of the house, but they sure aren't taking care of any windmill. I walk the westernmost path in Golden Gate Park, between the soccer fields and Great Highway. This could be called the Windmill Walk, but it probably doesn't have any name. Market Street Railway streetcars ran down this alley seventy years ago. When I lived in the Richmond and had a girlfriend in the Outer Sunset I'd occasionally take this path back and forth. Often there would be men standing on the side of the path, grim-faced, like highwaymen, sphinxes, or messengers from Greek myths. Other men would rumble around back in the shrubbery, seekers of anonymous trysts. Now the bushes and low trees have been hacked back, letting in the sounds of the Great Highway traffic, but eliminating the sexual lurkers. Granted it's an early Sunday afternoon, but I pass not a soul the whole way across. Instead, I have nasturtiums, white moths, bluets, California poppies... Dozens of ravens graze on the fenced-in soccer fields, their blackness on unnaturally green turf. Hazy puffs of white fog slightly muffle their riffling, hoarse complaints. My other companions are the fog horns. I may not see the Mile Rock lighthouse today, but I can hear it. Or do I? Perhaps that's Fort Point, Lime Point... I can't tell. I'm just glad they still have the horns. They tried to nix them, but the old timers complained until they gave in. If they could only drown out the generator and garbage can noises behind the renovated Beach Chalet. I eventually reach the Dutch Windmill and the riotous explosion of floral color surrounding it, the Queen Wilhelmina Tulip Garden. Here are people: seniors sitting on benches drinking in the beauty; a mother with two kids wrestling on the grass; bicyclists walking their vehicles on the winding path. A few real tourists are filming the windmill: a stolid, preposterous structure of wood and concrete topped by huge wooden sails, each one the grimace of a giant. The ungainly creature wears a dress of tan shingle, giving it a surprising femininity. 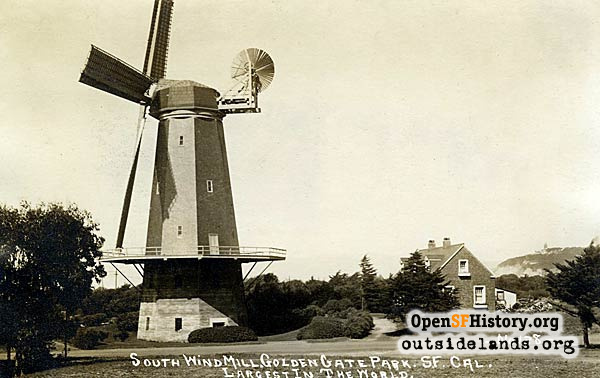 Seventy-five feet high, the Dutch Windmill was built in 1903. 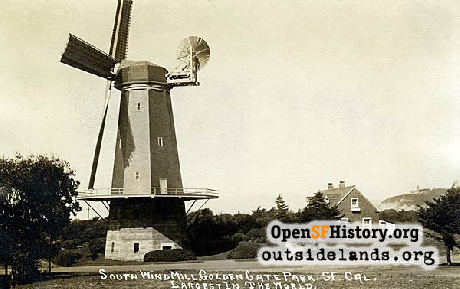 In 1913, motorized pumps began sucking out the well water, ending the windmill's ten years of usefulness. For decades it deteriorated in winter storms. The metal drives of World War II brought down the spars to harvest the banded iron. Eleanor Rossi Crabtree, Mayor Angelo Rossi's daughter, led a fund-raising campaign to restore the Dutch Windmill in the late 1970s. In 1981, with help from the Seabees Naval Reserve Unit, the sails returned to spin in the breeze again. The sails aren't turning this day. The great pumper of well water stands impotent, having successfully transitioned from functional beauty to ornamental curiosity. A restoration plan is underway and raising money to bring the Murphy Windmill back to life drawing water up again---this time for a picturesque artificial pond. 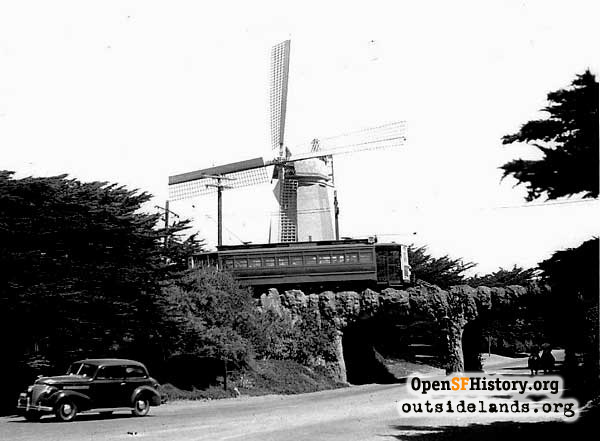 The Campaign to Save the Golden Gate Park Windmills says it will take $2.5 million to repair the old bird and $5.4 million for the greater plan, which would include lots of work on my "Windmill Walk" path. I hope it all comes off, with the sails of two mighty windmills creaking around on a foggy day. Let's put some fear-of-the-Lord in those pigeons! Bibliography: San Francisco Chronicle, Kathleen Sullivan, August 13, 2001; San Francisco Secrets, by John Snyder; The Windmills of Golden Gate Park, (pamphlet), San Francisco Recreation and Park Department. More on the windmills at Windmillworld.